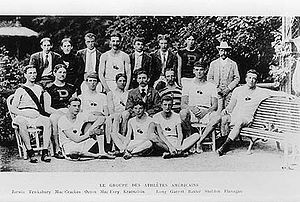 The USA Team for the 1900 Olympics. The whole team. Ah, they were simpler days. Is it an urban myth, or does the host nation really get to nominate a new sport to be added to the Olympic agenda? 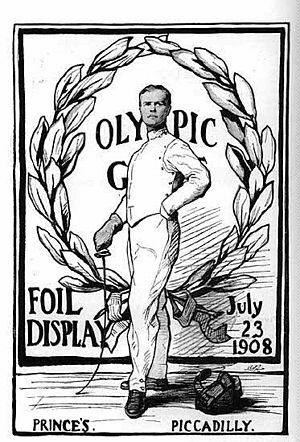 If it’s true, it would explain how, over the years, the Modern Olympic Games have evolved from a handful of events (just nine in 1896) into an extensive array requiring vast purpose-built facilities and a budget capable of crushing a national economy. 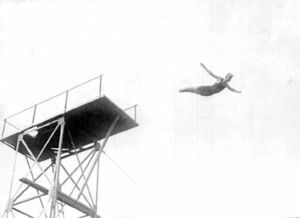 Arvid Spångberg winning the bronze medal at the 1908 Olympics for levitation. It must be tempting for the host country to designate a sport at which it, but preferably no other, excels. Next time the USA plays host, surely their choice must be baseball, whose so-called World Series extends no further afield than Canada. But they should take heed: if the need arises, Team GB could send in a crack squad, trained on its school playing fields in the primary school summer favourite game of rounders. After all, what is rounders, except baseball without the fancy dress, annoying hats and hot dogs? The unsuccessful Paris 2012 bid team must have mourned their missed opportunity to nominate boules. But if they had, we could have sent in, white-suited, the elderly of England, fresh from the bowling greens on which they while away a pleasurable retirement in between tea and cucumber sandwiches. A force to be reckoned with, indeed. Just remember Sir Francis Drake: called away from playing bowls at Plymouth Hoe, he dashed straight off to defeat the Spanish Armada. Should the Olympics sojourn on Caribbean shores, we might all have to limber up for limbo. But what could be more British than bending over backwards, accommodating whatever life throws at us, without really wanting to make a fuss? On tenterhooks, I’m waiting to see which sport Britain will add. I’m hoping for a tea-drinking marathon. With the amount of daily training that I put in, I think I could carry off the gold. What Makes An Activity An Olympic Sport? Previous Post What Makes An Activity An Olympic Sport?